Unlike many femme fatale, Jean McVeigh is neither beautiful, nor curvy. She was too thin, sallow flesh, too pale in tone for her untinted brown hair covered her jutting bones sparsely. No artifice enhanced her womanhood but this, in a certain way, gave her class. Jean McVeigh does, however, have what most femmes fatales want: money. She comes from a family of wealthy people on both her father and mother’s side. And like most femmes fatales she is lonely. Her (McVeigh’s) preoccupation with him was out of all proportion to the circumstances, or to sanity. She told this to herself over and over but failed to weaken her intense longing for another meeting. Jean was at a bad point of her life, the end of one phase and the beginning of nothing. Isn’t this great writing? Oh, but wait…there’s more. This is after a balcony scene in their hotel where Stuart falls from the balcony and is in hospital bed. Jean was tempted to pull away, escape the hypocritical arms, at the same time she wanted to stay within the warm circle of refuge. Behind him she saw the lilies, the iris, the beautiful dark grapes. Mrs. Howell had ordered the best and costliest care for her husband but had sent nothing personal, no flowers, fruit, books or cheerful messages. Too selfish, too absorbed in fear, completely possessed by suspicion, she had failed in kindness. Untrue to rebellious pride she had accepted a man whose life was dedicated to all she had rejected, the importance and accumulation of tangible wealth. Not so much for companionship, nor for solace, not even for her yearning body’s sake, but to show off her womanhood by the possession of a husband. This was certainly the case with Jean McVeigh. This entry was posted in Femme Fatale and tagged femmes fatales, JEAN MCVEIGH, MURDER PLOTS, THE HUSBAND, Vera Caspary. Bookmark the permalink. I am interested to learn more! This quite impressive blog!! Just goes to show you that a femme fatale is from the inside out, not just skin-deep…. Thanks for another interesting share. We watched a PBS documentary on Agatha Christie last night ~ fascinating. Wow. She sounds powerful…and scary. You really have an understanding of the type of character (almost a genre!). Another interesting author and character, Carol! Do you think there is a reason that this genre seems to be from years past? Has something changed with the way women are perceived to cause that effect. Interesting question. 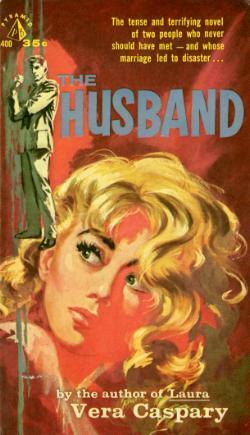 The femme fatale in American literature was made popular in the forties and fifties and most novels cited are by men but there were great women writers of that time who also included the femme fatale in their novels. My interest right now is to give place to these women writers that I think have been overshadowed by their male counterparts. I also think there is room for the femme fatale in modern literature. I’d love to write a novel with such a character as protagonist. I’m glad that you are highlighting these women. Maybe they wouldn’t have been overshadowed as much if they wrote later on in this century. The same goes for the US. This is quite astounding considering that the majority of readers are women. Carol – Another terrific entry in your series … love that cover! Wow! Quite a powerful and enjoyable debate. You always point out such great writers. Good on you, Carol.